The ASF grant program was created to help address two specific issues surrounding energy development in Appalachia: greenhouse gases, and stream and fishery restoration. While all Appalachian-based projects will be considered for funding, projects and programs benefiting Virginia and West Virginia will be given preference. 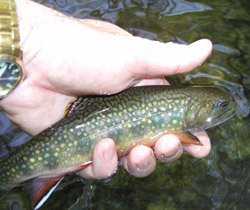 As to stream and fishery restoration, ASF has a particular interest in funding projects that would benefit any of the following areas: Shenandoah National Park, Dolly Sods and Otter Creek Wilderness Areas in the Monongahela National Forest, and James River Face Wilderness Area in the Jefferson National Forest. Special protections under federal law require these areas to have clean, clear air. fund public outreach and education about aquatic habitats and/or greenhouse gasses mitigation benefits, including the economic benefits of greenhouse gas reductions and the cost effectiveness of various approaches to such reductions. Examples include projects that would educate the public on how to use less energy, reducing costs for consumers and reducing greenhouse gas emissions. fund carbon sequestration projects and research. fund “on the ground” or “in the stream” projects that produce tangible greenhouse gas mitigation and/or stream restoration results in specific places. Examples include restorations that address acid rain and acid mine drainage, as well as repair of habitat damaged by mining activities. fund pilot projects and demonstration projects that establish the feasibility of innovative greenhouse gas mitigation projects (including estimates of the cost effectiveness of proposed projects in reducing greenhouse gasses) and stream restoration technologies and practices and would advance their transfer to common and widespread use. provide related community-based benefits in the priority geographic regions. provide opportunities to partner with other non-profit or for-profit organizations offering matching funding or in-kind support in order to leverage the impact of ASF’s grantmaking; the availability of matching funds is preferred but not mandatory. Also, in considering grant applications, ASF will consider appropriate partnerships or working arrangements with institutions of higher education and with businesses offering useful expertise, advice or in-kind support of ASF-funded projects. ASF may identify additional specific programmatic areas of interest for which it will proactively request proposals from appropriate organizations. ASF is interested in the potential for candidate projects to attract media coverage that will promote our organizational goals. ASF encourages organizations to reach out to ASF about grantmaking opportunities. To the extent practical, ASF expects to rotate its regular board meetings to visit communities throughout the Appalachian region in West Virginia and Virginia in order to better understand adverse impacts from energy development throughout this region, allow the ASF Board to learn about grantmaking opportunities, and appropriately raise the profile of ASF and its work, including among community leaders and other important stakeholders. Please submit all expressions of interest and grant applications through our website application form by clicking on the green “Apply for an ASF Grant” button. ASF will not review and will not be responsible for expressions of interest, grant applications, or any other information not submitted through the online grant application. Read a full description of ASF’s grant policy here. Get support needed to address harm caused by energy development.